On Nov. 4, the Coptic Orthodox Church based in Egypt picked their new Pope in a manner that presents important lessons for all religious groups in which replacing their top leaders is always marred by secretive maneuvering, controversy and acrimony. To pick their new Pope, the Coptics selected a nominations committee that considered a group of a dozen possible candidates, which it narrowed down to five. A vote by 2,400 church leaders then picked the three final names. Then, at a solemn ceremony at their cathedral in Cairo, a blind-folded little boy – himself randomly selected – reached into a glass bowl in which were three papers each with the name of a nominee and picked one with the name of Bishop Tawadrosthe – to be the new pope for the Coptic Christians. 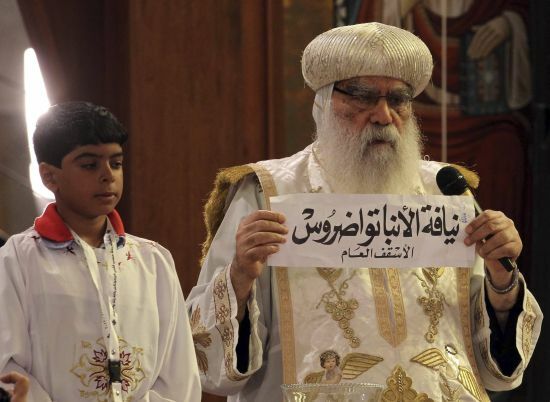 That practically and peacefully marked the end of a complicated election process that began when the church’s charismatic leader, Pope Shenouda III, died in March, 2012. Copts believe that the blinded boy’s hand is guided by God to pick the next leader. There is no politicking, no misgivings and no accusations of this or that, nothing. Definitely, other religious would be wise to borrow a leaf from the Coptics. It could probably help to deal with the disunity and hostility that more often than not comes with selecting new leaders in some religious groups. For example on Nov.9, just days after the Coptics got their new pope; Bishop of Durham Justin Welby was controversially picked by the Anglican Church to replace Dr. Rowan Williams as the next Archbishop of Canterbury. Naturally, lots of eye-brows were raised at the surprise choice of Welby having only been Bishop of Durham for less than a year. Even more surprising was the fact that Bishop Welby appears to have been favoured ahead of the Archbishop of York, Dr John Sentamu, who was an early favourite and who would have been the Anglican Church’s first black leader. As expected, the colour of his skin is being cited as a key factor in his disqualification. In the Catholic Church, a new Pope is picked in yet another opaque manner by a select group of cardinals who lock themselves up in a conclave for days – completely away from public view. Nobody knows the criteria they consider to make their choice. Additionally, picking Cardinals and archbishops for the various countries is the preserve of the Pope – another process riddled with secrecy and favouritism. Like in other countries around the world, picking new religious leaders in Uganda has always been a controversial issue. For instance in June, the House of Bishops of the Church of Uganda elected Stanley Ntagali as the replacement for Archbishop Henry Luke Orombi. However, supporters of the other contenders – Steven Kazimba Mbowa (Mukono Diocese), Joel Obetia (Madi and West Nile Diocese) and Nathan Kyamanywa of Bunyoro-Kitara Diocese – were largely left with discontent because they felt their various candidates would make a better archbishop. In the Islamic faith, there are currently two rival Muftis in Uganda – Kayongo and Mubajje – each of them sure that he is the rightful leader of Muslims in the country. Even if new elections were to be held next month, rival factions would still cry foul and accuse each other of abusing the process. Among the Born-again Christians, there are two leaders – Joseph Sserwadda and Alex Mitala but many pastors do not recognise any of them because the system of picking them was not transparent. Practically, therefore, the Coptics appear to have a better system. And it’s not entirely unbiblical as some might claim because the Coptics’ practice of choosing leaders by ‘casting lots’ is well documented in the Bible. For example, after the departure of their Master, the remaining eleven apostles had the task of replacing Judas Iscariot who had committed suicide after betraying Jesus. The apostles zeroed in on two men – Barsabas (Justus) and Matthias who appeared to have the requisite qualities. They prayed that the Lord would “show which of the two He had chosen” and put the final decision on a lot. “And they cast lots, and the lot fell on Matthias. And he was numbered with the eleven apostles.” (Acts 1:24-26). Even in the Old Testament, in accordance with the custom of the priesthood, the high priest was chosen by lot to enter the temple and burn incense (Luke 1:19). Well, that was many centuries ago, one would say. Is it workable today, another one would ask? Of course the advantage of using lots was obvious – to prove to everyone that an impartial decision on a matter had been made – from a human point of view – as it was God who was assumed to have made the final choice. After the lots are cast and the lot falling on someone, no one could again turn around and blame politics, nepotism, favoritism or corruption/bribery. It should be generally agreed that the impartial practice of casting lots, according to the Bible, prevents discord and contention between people, and takes care of arguments as well as any chances of trying to influence decisions through electioneering, politicking (see Proverbs 18:18). Eventually, it promotes unity and harmony in the religious community – as is clearly the case with the Coptic Church. So, would it be practical today for the various religious organisations to put such weighty matters to the lot after prayer? Of course it would, as the Coptic example clearly shows – because there is no doubt that the choice came immediately from the Lord. Would turning to lots be an indication of lack of faith and trust in God as some might claim? Well, no one can possibly claim to have more faith than the 11 Apostles who had physically eaten and walked with Jesus for three years. On matters such as who should be God’s servant to lead His people, it makes lots of sense to give God the ultimate chance to be the one to choose the person. Like the Coptic experience has clearly shown, there is indeed no other way to avoid controversy, acrimony and disunity because of a new prelate than putting the final decision to the lot.